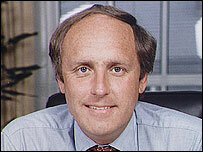 Daily Mail editor Paul Dacre has accused the BBC of "perverting political discourse". "The BBC, which glories in being open-minded is, in fact, a closed thought-system, operating a kind of Orwellian newspeak," said Mr Dacre. In rare public comments, he also accused David Cameron's Conservatives of being obsessed with the corporation. He said it was "far too early to say" whether his newspaper would support the Tories at the next general election. Mr Dacre, who has been the editor of the Mail for 14 years, was delivering the annual Hugh Cudlipp lecture at the London College of Communication. The newspaper, which is Britain's most popular mid-market newspaper, selling about 2.4 million copies a day, has traditionally been a staunch supporter of the Conservative Party. But Mr Dacre suggested in Monday evening's speech Mr Cameron should not take the Mail's support for granted at the next election. "The Mail's a Conservative paper. It would be very surprising if we didn't support the Conservatives. "Whether the present Conservative party is Conservative I don't know. We shall see," said Mr Dacre. He claimed Mr Cameron's decision to move the Conservative Party towards the centre ground of British politics had been influenced by the BBC's treatment of former Tory leaders. "Today's Tories are obsessed by the BBC. They saw what its attack dogs did to Hague, Duncan Smith and Howard. "Cameron's cuddly blend of eco-politics and work/life balance, his embrace of Polly Toynbee, a columnist who loathes everything Conservatism stands for, but is a totemic figure to the BBC, his sidelining of Thatcherism and his banishing of all talk of lower taxes, lower immigration and euroscepticism are all part of the Tories' blood sacrifice to the BBC god." He also accused the BBC of stifling debate and being against the conservative values held by millions of Britons. "The BBC, which glories in being open-minded is, in fact, a closed thought-system, operating a kind of Orwellian newspeak. "This, I would argue, is perverting political discourse, and disenfranchising countless millions, who don't subscribe to the BBC's world view," said the Mail editor. He said the BBC was part of a "subsidariat", which he defined as the parts of the media which could not survive in the open market place. This was dominated by the BBC "behemoth," argued Mr Dacre, which was creating a "monoculture" and distorting Britain's media market place.